I captured this image on a recent morning in McConnellsburg Pa. 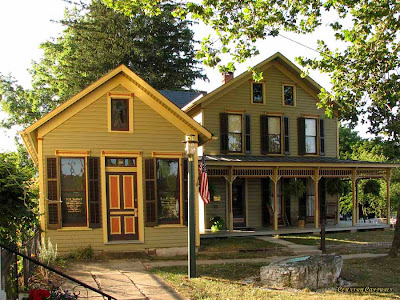 This home was built in 1892 with the matching two room law office adjacent to it. Recently restored and repainted its beauty contributes greatly to the Fulton County Courthouse Square’s appearance. Having completed my first year of blogging on Northern Lights I felt it was time to find a name which more accurately reflected the theme of my Blog. I spent considerable time reviewing and reflecting upon my previous post. Having lived my entire life in rural Pennsylvania, my blog naturally is “Country” based. Both the images and commentary “Capture” a moment in time either past or present, thus the new name “Country Captures”. 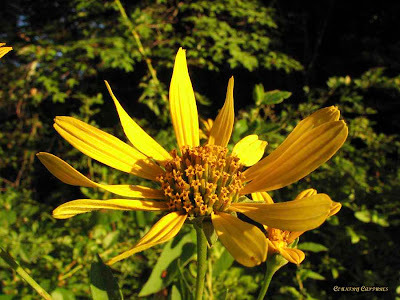 I captured this beautiful wildflower in the light of the early morning sunrise. Nature provides us with awesome beauty; we need only to take the time to “See”. Apparently we were not alone with Murphy during our ill fated vacation. My wife captured this image while returning home through Cambridge Md. Continuing on with our vacation we visited the Eastern Shore of Virginia National Wildlife Refuge located on the southern tip of the Eastern Shore. The structure shown in this photograph is one of two 16” gun emplacements here. 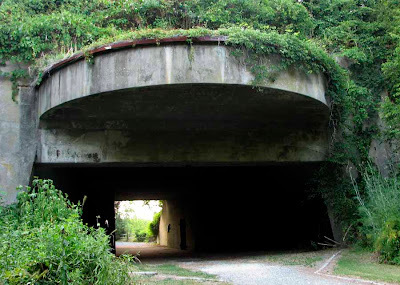 The big guns were placed here during WWII to deter enemy submarines and ships from entering the Chesapeake Bay. At this point the Chesapeake is only seventeen miles wide. With an effective range of over twenty-five miles firing a projectile weighing a ton or more the guns could cover this area with lethal fire. First named Fort Winslow in 1941 it was renamed to Fort Custis and then to Fort John Custis all within thirteen months. In 1949 it became the Cape Charles Air Force Station which closed in 1980 and became a national wildlife refuge in 1984. Today wildlife is abundant in this now peaceful place. The salt marsh at Oyster Va. contains a treasure trove for the photographer. This boat along with the one displayed in my earlier post “Sunken” are located near the road there along with another smaller but no less photogenic boat. This marsh is located at the end of the small harbor. 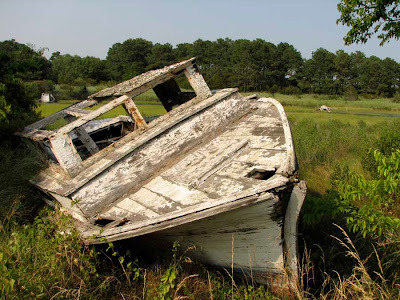 Possibly hurricanes and storm surges are responsible for depositing these boats in their final resting places. as well as the fact that it is now a floating hayfield. 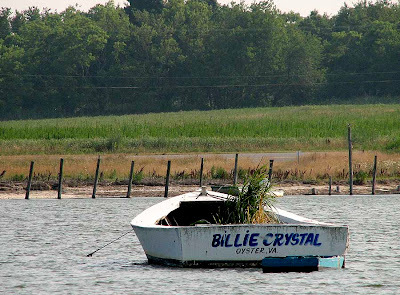 This photo was taken from the Cape Charles Va. Harbor. Bayshore Concrete Products manufactures pre-cast and pre-stressed concrete products for heavy construction at this facility. 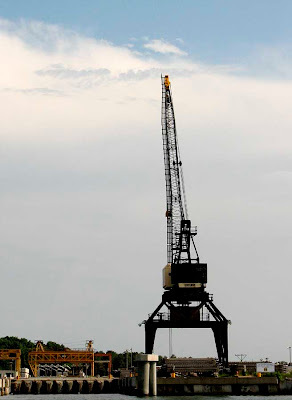 The waterfront location allows for inexpensive movement of raw materials and finished goods by barge. Murphy’s Law, and then Some! Our recent vacation was truly a Murphy’s Law experience. What ever can go wrong will go wrong certainly applied. However before you weep for us let me say we really did have a good although short vacation. I am a firm believer in the old adage “don’t cry over spilt milk” and when adversity does strike formulate an action plan and deal with it the best way possible and move on. This trip was planned as a six day fishing vacation. The lower Chesapeake Bay is an awesome place for inshore fishing. Many different species of fish are available in great numbers. In short it is virtually impossible to fish here without catching something. Murphy first visited me as I was hooking our truck up to our boat trailer Friday evening. I backed up close to the hitch, set the parking brake and jumped out to check my alignment. Whoa! The truck drifted back! Contact! One bent license plate but otherwise no harm. A check of the truck brakes revealed that the left rear brake was not adjusting properly. With a few minutes of work I corrected it and connected it to the trailer. Checking the connection and the trailer lights revealed no other problems. 2:30 AM, time to roll. As the truck warmed up I did a walk around of the rig. The smell of burning plastic hung in the air near the rear of the boat! What now? The rear light bar is smoking and is no longer lit! Well it’s required by law but it is time to go. Our friends who are accompanying us will be expecting us on time and besides I do not have a replacement at hand so a quick snip with the wire cutters and a little electrical tape over the hot wire and we hit the road. As we pulled onto the road my wife reminded me that problems comes is threes and wondered what would be the next shoe to drop. The 325 mile trip to Kiptopeke State Park went well and we were on the water by noon. Murphy’s next visit though was not long in coming. After baking in the 100 deg. heat the girls decided to give up fishing and enjoy the sights and shopping in air-conditioned comfort while the boys fished for the remainder of the trip. While putting the transom straps on the boat following fishing I heard a loud crunching noise. The strap had broken! Well now, that’s not too bad and besides we have had our three now, the remainder of this trip will go well. RIGHT!!! Sunday and Monday went well. Great fishing, good food, with a little sight-seeing thrown in but Murphy was already planning his come back. Tuesday I launched out of Cape Charles Va. and ran out about three miles to a popular flounder fishing area near buoy 36A. When the current began running hard flounder started hitting fast. Wow! This is the best fishing we have encountered so far. We were fishing a ledge that dropped from 30’ to 80’ depth and the flounder were holding between 35’ & 40’. A short drift over this depth range accompanied by a short run back was the tactic that was putting fish in the boat. As I attempted to start the boat for the umpteenth time, CLICK, CLICK, CLICK only the sound of the solenoid throwing the starter bendix in could be heard. The starter would not run! Time to get the tools out, remove the battery connections, clean, replace try again, CLICK. Now we have to get serious! More checking, more cleaning, switch batteries, the starter turns the engine over but no luck, it still won’t start. This boat is dead! 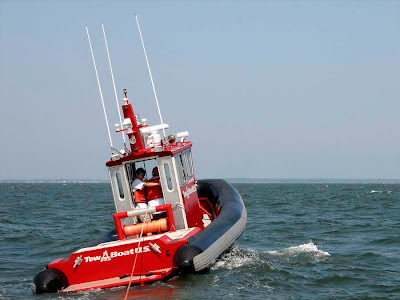 Now is the time for the ultimate back up plan, Tow Boat U.S.! (Boat U.S. is the boaters equivalent to AAA) A call to the national dispatch center put me in contact with a local operator. We were told his Captain was making a boat delivery and would call us soon with an estimated time of arival. An hour passed with no call so I called this Captain. Not good! This was the first he had heard of us! He informed me he would be on his current tow for another hour and a half and that he would try to locate another tow boat. Soon he called back telling us he was successful and this operator would call in a few minutes. Shortly our cell rang with the good news that they would be underway in fifteen minutes and would call back with an eta as soon as they entered the bay. Forty five minutes passed with no call, a call to the cell number he provided went direct to voice mail as did the next call ten minutes later. Two and a half hours have now passed since the initial call and I am beginning to become concerned. We have been drifting as the water is too deep to anchor and now there are no other boats in sight. A call to the dispatch center voicing my concern finally straightens the situation out. We learned from our rescuer that the duty captain was having cell phone problems. With it being a slow day he had decided to drive into Norfolk and get it fixed thus the delay as an off-duty captain had to be found. The ride back to Cape Charles was rough! Our tow boat captain did a great job but being towed is a rough ride when being pulled through the waves. Checking out the boat onshore provided no more clues to our dilemma and as the objective of the trip was fishing the decision to return home was made, but remember troubles do come in threes and we are up to four! Does that mean there are two more to go? Yep! It sure does! On the way home we stop at a filling station in Cambridge Md. With the pay before pumping, I give the cashier a $50 and return to pump number seven. The pump kicks off at 23 cents! Back in the store I find a man trying to pump diesel talking to the cashier in an exasperated tone, a lady from the deli accompanies him to the pump. I explain my 23 cents worth and the cashier refunds my $49.77. “But I still need to fill up”, I explain. She gets the manager. The manager asked me to move to pump 9; while informing me that they are having problems with some pumps. Have you every tried to maneuver a truck with 25’ of boat and trailer around a busy filling station? It ain’t no cake walk! I quickly decided to find another station. Upon returning to my truck our friend who was following behind met me at the truck door saying “you are not going to like what I have to tell you”! 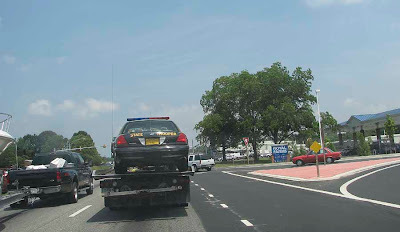 “Your license plate for the boat trailer is gone”! A glance revealed that the plastic bracket had broken. OK six problems! Enough! I give up! Just let me get home! One more and we will have to go for 9! No! No! Just let us get home! And with that our problems and our vacation ended. The remaining 150 miles rolled by, the sun shone then the rain fell and all was good in our world! A VERY Memorable Vacation! Ps. The boat problem proved to have begun with one of our batteries failing which in turn fried the ignition system. Now she sits on the trailer in our driveway and “purrs like a kitten”. 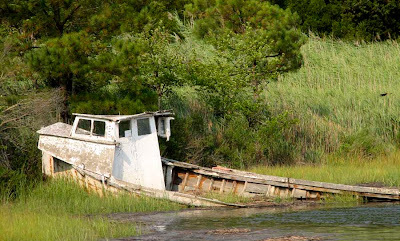 While vacationing on Virginia’s beautiful Eastern Shore I noticed this old boat lying in a salt marsh. I passed on photographing her in the harsh light of noon and returned later to capture her in the warm low angle light of evening. I consider this the best image I captured on our trip. Not only was I captivated by the beauty of the scene but it also appropriately illustrates what was truly a Murphy’s Law vacation. I once believed that problems came in threes, on this vacation it certainly did, twice over. The final straw caused us to return home two days early but that must wait for a later post. Today I pause to celebrate the completion of my first year of Blogging. It has been an interesting year to say the least. When I began I had no intention of doing anything serious with it. My son, Chad Oneil, and some of his friends began blogging. I in turn registered with blogger as Salty Dawg and began leaving mysterious comments on their post while dropping clues to my identity along the way. All were wracking their brain; following the clues in their attempt to solve the puzzle of the “Mystery Commenter” who seemed to know so much about them. In the end Chad “Super Sleuth” Oneil called our home and asked to speak with Salty Dawg! Having found the photoblogging community to be a friendly place I decided to clean things up and begin a reasonably serious piece of work. I have been impressed with this online community. Particularly with the friendly, supportive comments which I very much appreciate. In a venue where all comments are for the most part anonymous, I have yet to receive a comment that I find offensive. I appreciate my loyal readers; you are the folks who drive me to make the next post at those times when I am experiencing Bloggers Block, you are the motivation forcing me to pick up the camera and head out at times when I feel I would rather sit on the porch. I enjoy reading your blogs and find inspiration in the writing and images you post. I have learned much about our world from your blogs, I have enjoyed visiting many places both far and near through you photographs and I have learned a great deal from all of you about our common interest in photography. During this past year I have made 184 posts. The purpose of each post varied; many were to share the beauty I encounter, in others I shared a glimpse of my life, past and present, some were to educate you the viewer on issues concerning wildlife management and sharing my opinion on these matters, while in others still I have shared the philosophy that I have developed while spending over one half of a century traveling down this path of life. 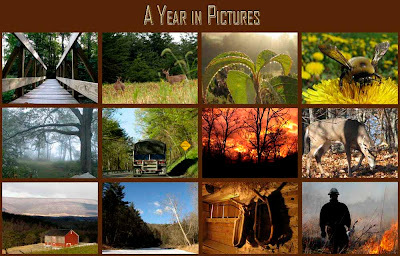 The image posted here is a compilation of one posted image selected from each month. As for now my plans are to take a few days off, collect some new images and then be back refreshed and renewed with great anticipation of the joys that my second year of blogging holds in store! Thank you all for making this First Year of Blogging such an enjoyable and fulfilling experience! Pennsylvania DCNR (Department of Conservation & Natural Resources) has actively been attempting to reduce deer numbers on the State Forest lands under their control. Their position is based upon the damage the deer herd is doing to the timber production and the biodiversity on these lands. This has become a political “hot potato” in the Keystone State. Hunters want as many targets as possible and have been very vocal about the herd reductions impact upon their sport. Farmers trying to eke a living from the soil have also been seeking a reduction in deer numbers. The Pennsylvania Game Commission is caught in the unenviable position of trying to find a middle ground where all factions can arrive at a consensus. 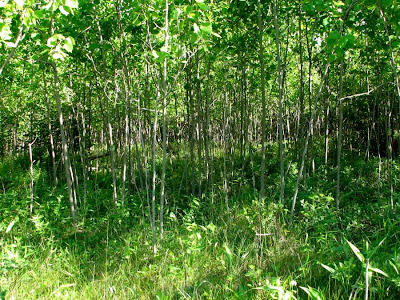 The impact that deer have upon regenerating woodland, once only hypothetical, has now been put to the test. The photos accompanying this post were taken in an area clear cut a few years ago. Both were taken while standing upon the forestry road, first looking south where the new growth was allowed to naturally regenerate. 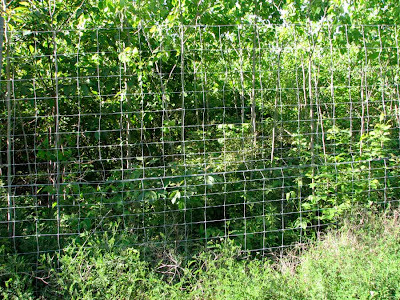 The second was facing north where as you can see a deer retardant fence stands. Judge for yourself, but in my opinion the difference is clear cut. While we celebrate this Independence Day let us not forget the cost. So often we honor our men and women in uniform past and present as the ones who have sacrificed that we may enjoy this great gift of Freedom. Let us not forget the sacrifice of their families at home. We cannot forget the mothers longing for their sons return, the young wife wondering if her child will ever see Daddy, the father lying down to rest after a hard days work only to find sleep will not come as he worries about what is happening to his son’s unit currently deployed in the desert sands. Let us not forget the grief of the families who’s loved one returns as a casualty of war. Let us not waste the Great Gift of Freedom for which they all have paid so dearly. Our media thrives on reporting about what is wrong with America. Reports of our problems fill our air waves; friction between races, ethnic groups, citizenship status, political parties etc is reported by news anchors who’s demeanor suggest that they are an authority on each and every story they report when in fact they are only actors who’s job it is to drive ratings with no regard for the damage they may do. In this age of Globalization some business leaders think only of the short-term profits outsourcing off-shore can bring. Wall Street money managers coolly calculate their next strategy of how to legally separated working people from their hard earned cash. We are over run by politicians whose main concern is filling their campaign chest that they may once again win reelection while representing their major campaign contributors and not the citizens of their district. 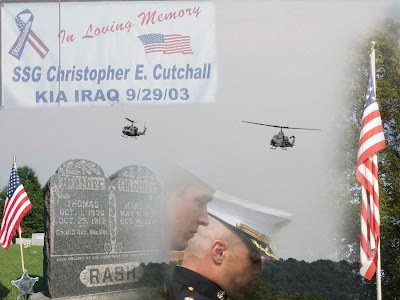 Collage Notes: The banner in memory to Christopher Cutchall is from a memorial display on the side of his parents barn, The Helo’s along with the Marine & Sailor are images from the dedication of a Memorial for a young local Marine KIA in Iraq. The tombstone is that of my Great-Great Grandparents. Great-Great Grandfather served with Company B 3rd Regiment Maryland Volunteers in our Civil War. The sounds of booming Bass Fiddles, racing Banjos, heavy rhythmic Mandolin chops, and the sweet melodies of the Resonator Guitar filled the air along with the timeless harmonies unique to Bluegrass Music. Bands came from a three state area to display their talent. 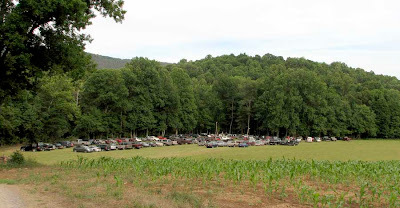 Country folk gathered to enjoy the evening of music and homespun whit combined with good conversation. Po’ folk and millionaires sit and visit in this setting with no indication of differences of social status. 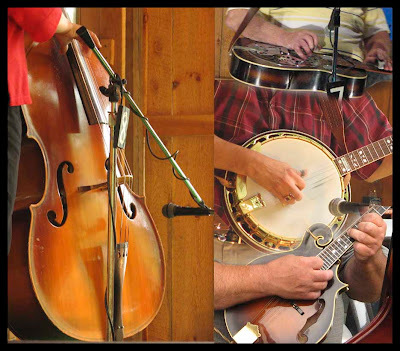 Bluegrass at the Old Home Place is an annual tradition dating back nearly three decades originally hosted by The Sounds of Grass and now by The New Connection. Could this farmer be trying out a new crop? I captured this crop as it was appearing in the field. After much preparation it took only an hour or so for it to appear and grow to its mature size.